Our Enemies Are Extremists! - Really? No Kidding!? Today in a joint news conference, both U.S. Attorney General Alberto Gonzales and Department of Homeland Security Secretary Michael Chertoff referred to the United Kingdom terrorists plotting to blow up planes departing from the United Kingdom en route to the United States as extremists. Where did we find these politically correct Einsteins? Heaven forbid Gonzales and Chertoff offend, rather, they continue to be politically correct in the face of potentially thousands of deaths of innocent travelers. There are a lot of extremists around, including the ACLU, MoveOn.org, the DNC, the KKK, the NAACP, and the New Black Panther Party. Fortunately, most extremists are not actively trying to kill us. While it is true the terrorists we are concerned about are extremists, they are also all Muslims and they are, at the very least, trying to destroy our way of life, and would ultimately like to kill us for being infidels/non-believers. 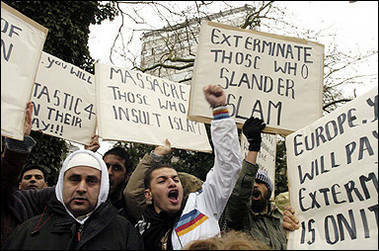 Therefore, they should be described as Muslim extremists, or Islamofascists. I am also not prepared to believe that they are a small percentage of the Muslim community. I believe the reality is that these terrorists are an extremely large percentage of Muslims who live among us, worship at the local mosque, shop at the local grocery, send their kids to the local school, walk the local streets, and they want to kill their neighbors, and you, and me, and Bobby McGee. I am comforted by the disclosure that the English Home Secretary, John Reid, is keeping our Department of Homeland Security, better known as 'the gang that couldn't shoot straight,' apprised of its investigation of the latest al Qaeda plot to kill thousands of travelers between the United Kingdom and the United States. Rest assured Homeland Security Secretary Michael Chertoff is on the case and, in the press release below, Secretary Chertoff promptly changed the color code of the threat level today. For that reason, the United States Government has raised the nation’s threat level to Severe, or Red, for commercial flights originating in the United Kingdom bound for the United States. This adjustment reflects the Critical, or highest, alert level that has been implemented in the United Kingdom. To defend further against any remaining threat from this plot, we will also raise the threat level to High, or Orange, for all commercial aviation operating in or destined for the United States. Consistent with these higher threat levels, the Transportation Security Administration is coordinating with federal partners, airport authorities and commercial airlines on expanding the intensity of existing security requirements. Due to the nature of the threat revealed by this investigation, we are prohibiting any liquids, including beverages, hair gels, and lotions from being carried on the airplane. This determination will be constantly evaluated and updated when circumstances warrant. These changes will take effect at 4:00 AM local time across the country. Travelers should also anticipate additional security measures within the airport and at screening checkpoints. The United States and the United Kingdom are fully united and resolute in this effort and in our ongoing efforts to secure our respective homelands. I have been told by a reliable, but anonymous source from within the Department of Homeland Security that additional security measures at all American airport security checkpoints will now include removing your shoes and your socks before being allowed to pass through security. Subsequently, if the stench from the exposed feet sets off the explosive trace detection machines (ETD) or the explosive detection system machines (EDS), travelers will be required to wash their feet. Thank God for Department of Homeland Security Secretary Chertoff and the terrorist threat color code. World War III - The New Crusades! 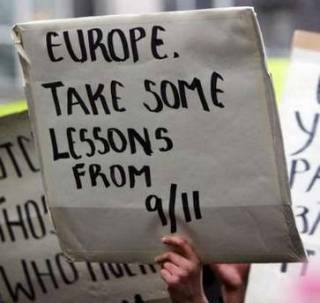 If you thought I was kidding after you read my last three posts, you must know that, in light of the arrest of 21 al Qaeda terrorists in London who were plotting to blow up 20 planes en route to the United States, I was not. This is a worldwide war against civilization as we know it by the Muslim world, and life is going to become much more complicated for us all in the coming days, months, and years. 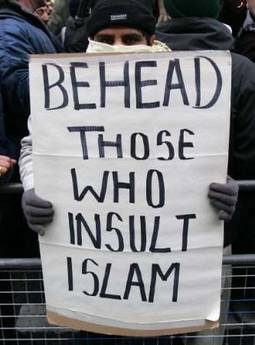 The Muslim religion is infected with a virus - the virus of hate. 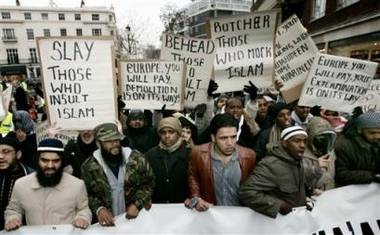 Government and religious leaders who would have you believe that we need only worry about a few radical Muslims are delusional. We must not be diluted into believing that this is only a small radical fringe of the followers of Muhammad who are conspiring to undermine our way of life. Mark my words...Take it to the bank...Write it in stone...Ultimately, this war will be waged by a majority of the Muslim world against us and our way of life and, unfortunately, they will keep coming after us until we eliminate them all by whatever means necessary. These pictures, which haven't appeared in the American MSM, are of Muslims marching through the streets of London during their recent "Religion of Peace Demonstration." There are nine pictures, however, the first picture really says it all. 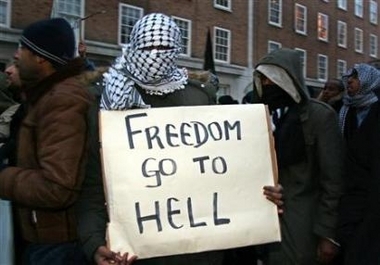 Whether you think we are at war with the Muslim world, the Muslim world obviously thinks it is at war with the us. Civilization hangs in the balance. Tip of the hat to G. Welty. Massive demonstrations in the streets of Baghdad this past week calling for death to Americans and Israelis while extolling the virtues of Hezbollah leader Sheik Hassan Nasrallah have been very disappointing. While it would seem that great strides have been made in bringing democracy to Iraq, it may be that the Iraqis just aren't ready to self govern. President Bush '41 had it right when he left Saddam Hussein in power after the first Gulf War. The Iraqis only seem to behave themselves when a strong-man like Saddam treats them like children, and tortures and/or kills them when they misbehave. We have spent more than 2,500 lives and hundreds of billions of hard-earned dollars to bring self-rule to Iraq, yet there is obviously no one in Baghdad who appreciates the effort. Every day it becomes more apparent that there are no real reasons for us to to continue trying to root out troublemakers in Baghdad - the city is full of irrational troublemakers, none of which is is worth the value of the elements that make up their DNA. Perhaps we should surround Baghdad, cut off all routes in and out of the city, and let the inhabitants continue their civil war until there is no one left. The Muslims will be happy because they have gone to be with Mohammed and the virgins that await them in hell, and we will have cut our losses without running. Everyone wins. 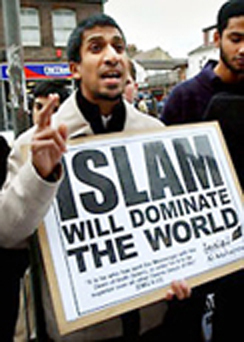 Just as Nazism, the ideology held by the National Socialist German Workers Party, has been outlawed in Germany for many years, and Shinto was completely separated from Japanese politics after World War II, the time has come to outlaw Islam. Although Nazism is a social and political ideology, and not a religion as Islam purports to be, the basic tenants of both extol the supremacy of a certain group of people while attempting to speed the demise/extinction of other groups by whatever means necessary. 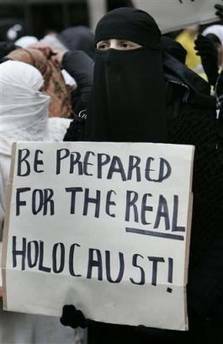 The only real difference between Nazism and Islam is that, while Nazism spread its message in the beer gardens of Berlin, the Islamic religion spreads its message of hatred, death and destruction in its mosques hiding behind a twisted god. Nazism, or more correctly National Socialism (German: Nationalsozialismus, often abbreviated NS) is a political ideology promoting Germanic racial supremacy and a strong and centrally governed state. Nazism has been outlawed in modern Germany, although remnants and revivalists, known as Neo-Nazis, continue to operate in Germany and abroad. The term is derived from the word Nazi, which is used to label the supporters of the National Socialism. In 1946, during the American occupation of Japan following World War II, the cult was completely separated from the state by order of General Douglas MacArthur, supreme commander for the Allied powers. Government financial support of State Shinto was eliminated, the former practice of teaching cult doctrines in the schools was abolished, and the use of Shinto symbols for nationalistic purposes was forbidden. Lebanese Islamo-fascists, aka Hezbollah, with a stockpile of over 10,000 rockets, have fired over 2,000 rockets into Israel in the past two weeks. Unable to really aim their rockets, the Hezbollah point them in the general direction of a town hoping to kill or maim somebody; anybody. Elsewhere in the world, Islamo-fascists are blowing up buses, trains, planes, ships, hotels, embassies and office buildings, indiscriminately killing innocent men, women and children in the name of Allah. Left-wing ideologues would have us believe that there is some root cause of the violence. The notion that we have overtly done something to deserve the death and destruction by the Muslims is peddled by bleeding hearts, but the truth is that no matter what the civilized world does for the Islamic world, it would never be enough. The left would have us believe that we can negotiate with these animals. The bleeding hearts are delusional. The Islamo-fascists will not be satisfied until all secular laws are replaced with Islamic law and all non-believers are dead. 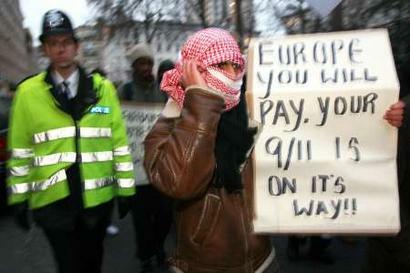 The civilized world is involved in a war against Islam. It's time to turn away all Muslim's who would emigrate to America. It's time to close the mosques in America and jail or expel the fascist clerics. 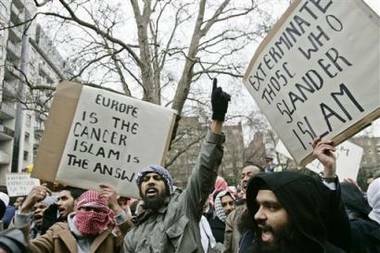 It's time to jail anyone who outwardly displays any alliance with, or allegiance to, Islam. Just as Nazism has been outlawed in Germany and Shintoism was outlawed in Japan, the time has come to outlaw Islam worldwide. If you do not believe this is World War III, you soon will. The bloodthirsty Islamo-fascists are willing to die for their religious beliefs, and the time has come to accommodate them. The sooner we start to kill them the better, because there will be no peace until they kill us or we kill them.